shut a gasoline-making unit, prompting it to sell naphtha, multiple traders that participate in the market said. The gasoline-making unit, known as a continuous catalytic reformer, which has a capacity of 84,000 barrels per (bpd), was shut a 'few days' ago, the sources said, but it was unclear if the unit has resumed normal operations. Yasref does not usually sell heavy full-range naphtha as it uses it as a feedstock for the reformer. 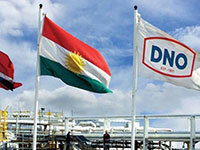 OSLO: DNO will pay its first dividend in 13 years following strong half-year earnings, and the Middle-East and North Sea focused oil company also said it would demand seats on the board of London-listed rival Faroe Petroleum. Earlier this year, DNO built a 28.23 per cent stake in Faroe, becoming its largest shareholder, and prompting speculation about a full takeover. Faroe’s board unanimously recommended that shareholders reject DNO’s proposal to appoint two DNO executives to its board, saying it could cause conflicts of interest. NEW YORK: Oil companies bid on less than 1 per cent of the parcels offered in a sweeping US auction of Gulf of Mexico exploration leases, showing tepid interest in the region for the second time this year. Oil giant ExxonMobil Corp was awarded 25 blocks, the largest of any company, followed by BP with 19 high bids and Hess Corp and Equinor, which each had 16. Smaller companies, including Talos Energy Offshore, Houston Energy and W&T Offshore were among the top ten high bidders. In total, 23 companies bid in the US Bureau of Ocean Energy Management’s auction. ACCRA: Oil production from Tullow Oil’s TLW.L offshore Tweneboa, Enyenra and Ntomme (TEN) field in Ghana is expected to hit full output capacity of 80,000 barrels a day by 2020, a local manager said. TEN, with reserve estimates of 240 million barrels of oil and associated gas of 60 million barrels, produces around 56,000 barrels currently, external affairs director Cynthia Lumor told reporters in Accra.